Let's face it, Hollywood Blvd is not typically what comes to mind when thinking of a place to eat, unless I happen to be catching a show at the Pantages or drinking nearby. 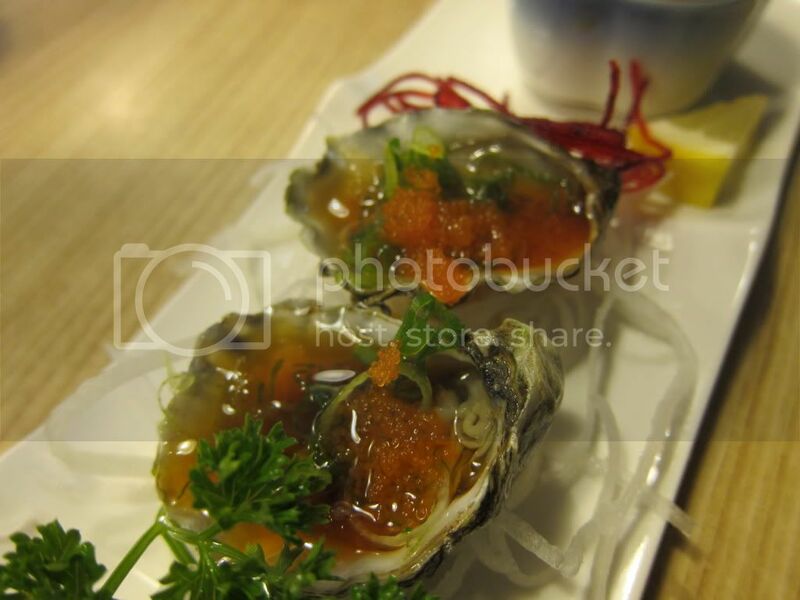 But recently I was invited to check out Totoyama Sushi and Ramen, a casual Japanese spot in the same complex as Greenleaf and Pressed Juicery. There's no Hollywood glitz at Totoyama, but the space is nice and comfortable, and the food was surprisingly good and prices were affordable! Totoyama usually offers an omakase with 10 pieces of nigiri and miso soup and edamame for $48, but they also had a sampler of Japanese fish. I got the Japanese fish sampler combo for $58 which included 4 different 2pcs nigiri and one piece of uni. I thought it was quite a good deal 9 pieces which included uni! Each sushi was dressed individually. I believe I opted for the aji (mackerel), kanpachi, sea bream, and since they were out of one item I had the salmon. 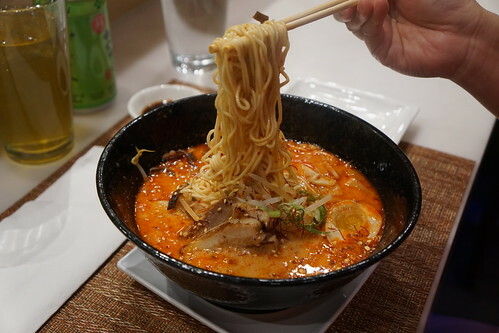 My friend got the spicy miso ramen ($13) which had a rich and flavorful broth, and pretty spicy. Too spicy for me, but she quite enjoyed it. Sushi | Bar is hidden inside Woodley Proper. You check in at Woodley Proper and wait at the bar with a welcome cocktail before the party is escorted to the secret room. 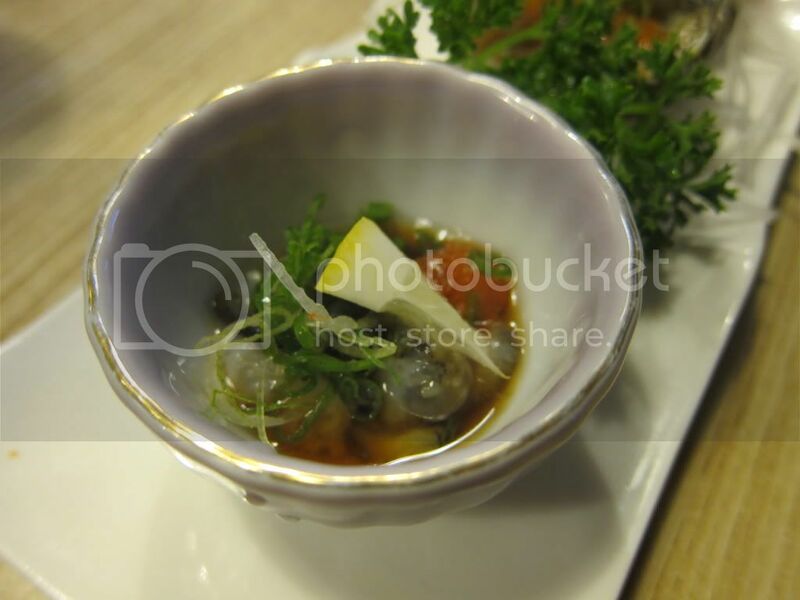 Sushi | Bar is not a traditional Japanese sushi restaurant. Phillip Frankland Lee and his team serves up a creative 17-course omakase of sushi with unusual garnishes and preparations. We chatted with the sushi chefs and other diners and the 17 courses and their drink pairings come and go in rapid succession. I wasn't able to take detailed notes of every single preparations and photos of all the dishes, unfortunately, but here are what you might expect out of this wonderful and unique omakase experience. 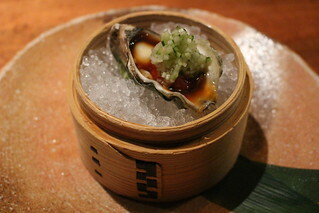 We started with a West Coast oyster with whipped nigorizake and caviar, among other ingredients. I opted for the drink pairing which mixed in sake, beer, and cocktails - starting with sake to pair with the oysters. The prawn was paired with a cocktail made with Japanese whisky, port, lemon, matcha, kelp, soy - the three ingredients matched the garnish on the prawn sushi itself. 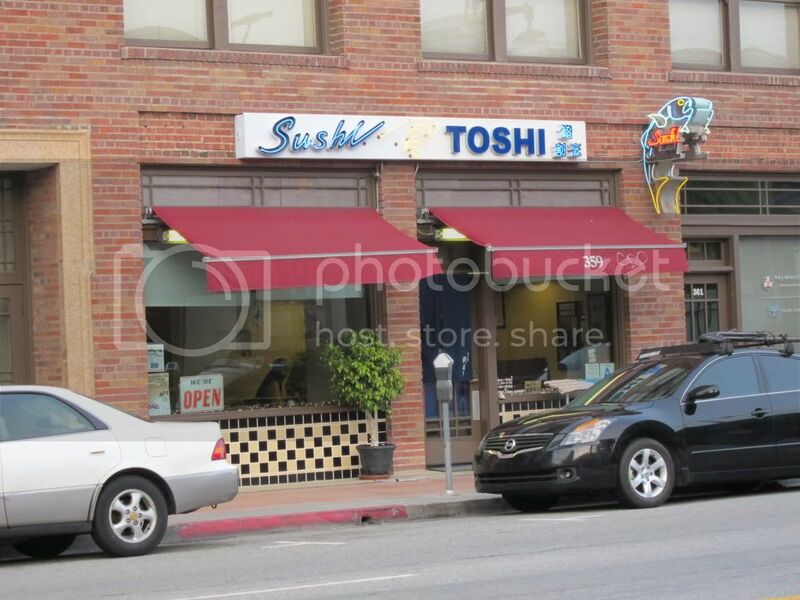 One of the latest high end sushi restaurants to open in Los Angeles is Q Sushi in downtown. It's a quiet dining experience: he interior is stark, but certainly well thought out and elegant. The man behind the operation is Chef Hiroyuki Naruke who ran a small sushi bar in Tokyo but moved to Los Angeles after the tsunami in 2011. 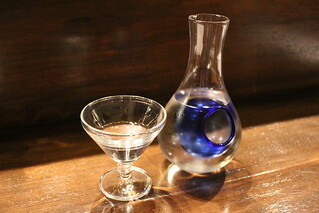 When you arrive, the only menu you'll be given is the drink menu of wines and sake. 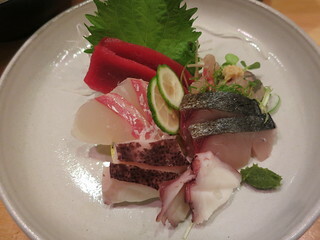 Your dinner will be the chef's choice omakase. 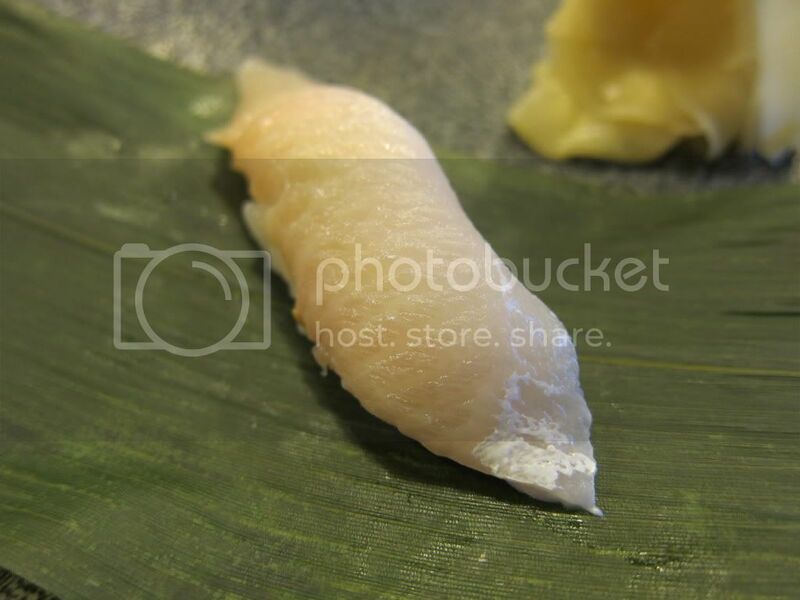 Q has been called the most traditional, "real edomae" sushi in LA, which focuses on the flavors of the fish rather than the rice or condiments (says the J Gold). I suppose it's true that LA has had a fascination with sushi rice since the days of the Sushi Nazi. 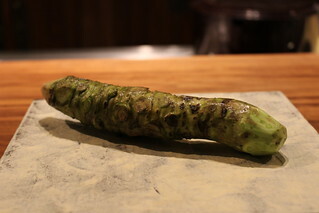 Waiting for my perpetually late LA friend, my sushi chef (not Naruke) entertains me by showing me their wasabi from Shizuoka. 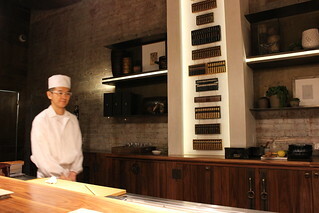 Just like the restaurant, chef Naruke is a quiet man and he oversees everything even when he's not making the sushi. 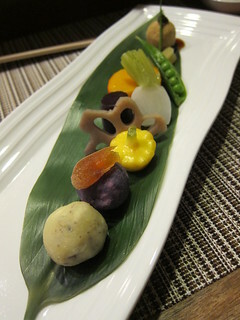 The touch of the dressing and sauces here are delicate, not a drizzle more that might overpower the fish. 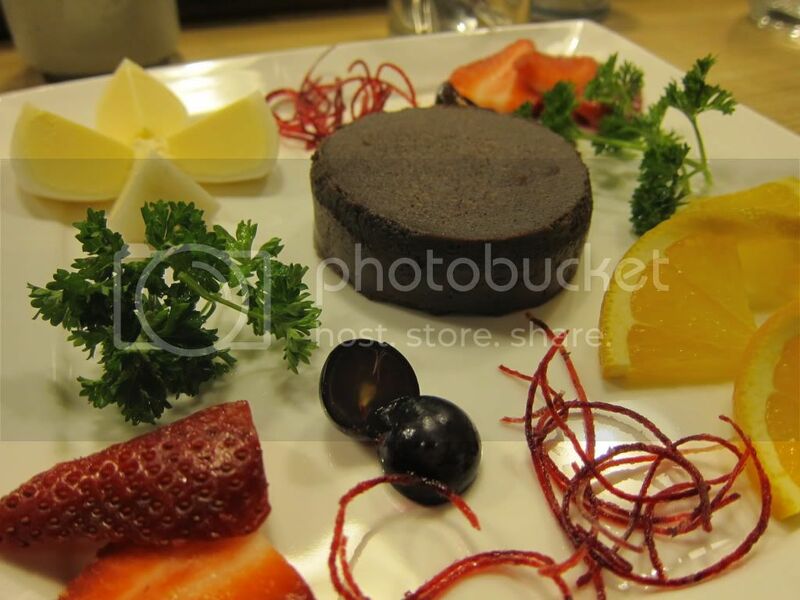 The first time I've had sashimi with black sesame, and I certainly enjoyed the unusual combination. I loved the texture of the seared hamachi and the banana pepper mousse worked well, although it slightly overwhelmed the hamachi flavor. Maybe slightly less mousse on top? Moromi is a term you may hear in sake brewing, and I believe it basically means the unrefined or unfiltered mash of grain that is undergoing fermentation. 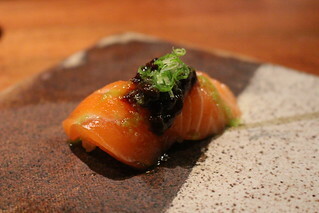 I enjoyed the earthy flavor with the fatty salmon. An unbeatable combination, of course. It's easy to spend over $100 on a sushi omakase, and while some of them are certainly worth the money, you can't do that too often. Instead, most of us frequent the mid-tier, affordable sushi joints - some of which provide really good value for the money. 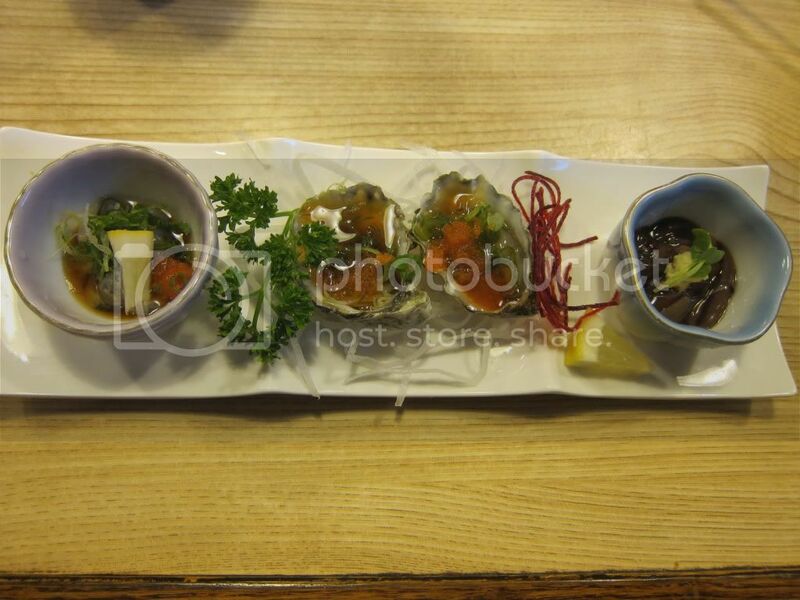 The best value for sushi omakase may well be Sushi Nozomi down in Torrance. The "chef's choice" or omakase is only $38 for 10 pieces of sushi plus a negi-toro roll and we're talking fresh fish, some of which are pretty hard to find in town! 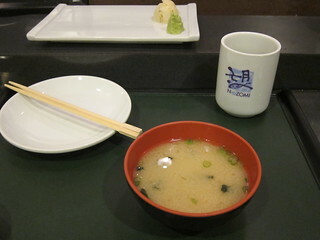 Each omakase starts with a bowl of miso soup. Blue nose. This fish looks similar to a bass or grouper, leaner than the former but fattier than the latter. Full disclaimer: I came here on a hosted media lunch, but I had also come back twice after that on my own dime (granted one of them was using the 30% off from the awesome Blackboard Eats). 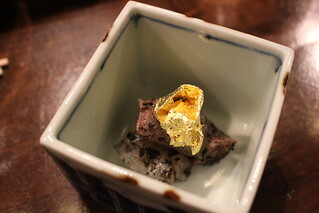 Hamasaku in West LA has actually been open for many years and is a Zagat favorite, but for some reason I hadn't really heard much about it and had not been until I was invited in. I've missed out! This place was great. 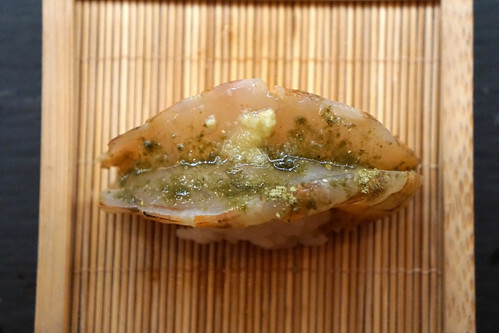 The omakase listed on the menu ($75) actually includes a lot of cooked items, so here's a tip: Go on any other day but Monday and sit at the sushi bar, preferably in front of the sushi chef, Yoya, who used to work at Sashi in Manhattan Beach. 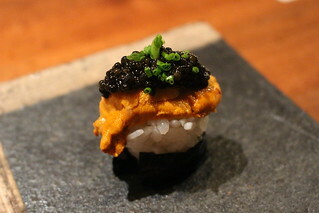 Big uni pieces and so fresh, but the best part is the contrast with the crunchy yuba. What a wonderful start to my lunch! 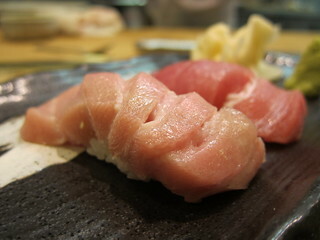 This tuna is very rich and fatty, almost like a chu-toro. Loved it. 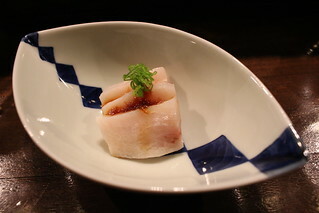 For the sushi they use haiga-mai (half-milled) rice. It's half way between brown and white rice so it has more nutrients than white rice but tastes just like white rice. 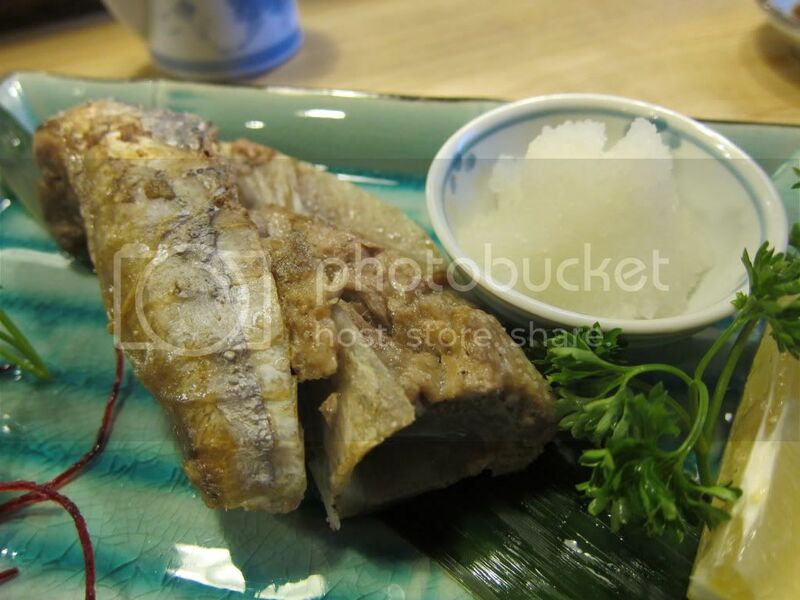 When they built Sugarfish in Beverly Hills, they had planned for Nozawa Bar all along and kept a room in the back for that sole purpose. 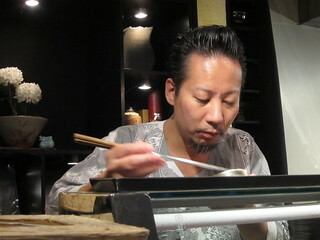 Now, Nozawa Bar is open and taking reservations for ten people, two seatings per night for a sushi omakase experience. It's not Nozawa wielding the knife, but Osamu Fujita has long worked with Nozawa and has his stamp of approval. 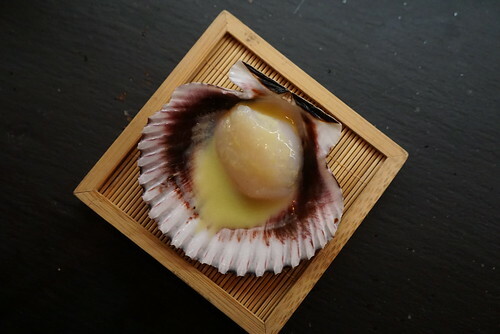 After my omakase meal there, I would say perhaps the setting and timing actually allows for a more refined experience than the busy Sushi Nozawa was in Studio City. 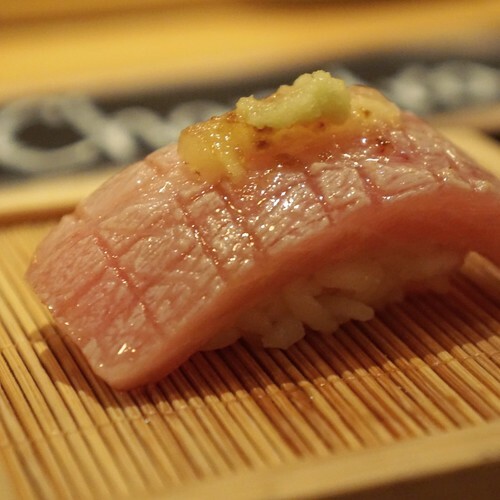 I knew my sushi, or thought I did, but for more than a couple of courses at Nozawa Bar I had a few moments where I went "no way, that wasn't ...". There were moments of learning that season really matters, and preparation matters. More on that later, on to the meal first. As I said, there are two seatings per night for everyone (at 6PM and 8:30PM), so don't be late! 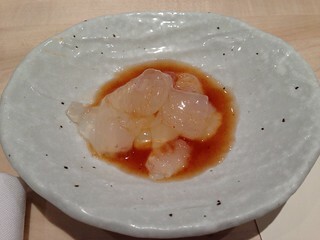 I was five minutes late and missed Fujita-san slicing up the jelly fish for the first course. I didn't miss eating the course, though, luckily (everyone is served the courses at the same time). 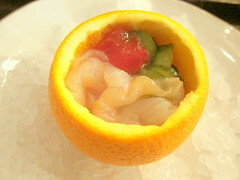 The crisp jellyfish was a nice opener to whet your appetite. 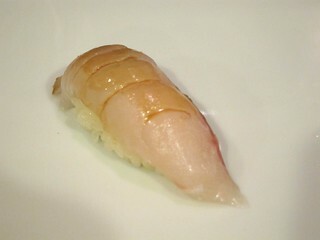 The nigiri courses start out with a bang with the chu toro. 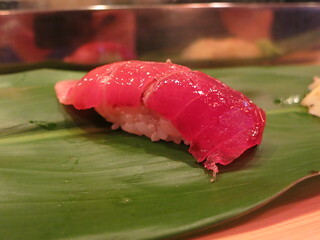 This a blue fin tuna chu toro, although the fattiness is close to oo toro. 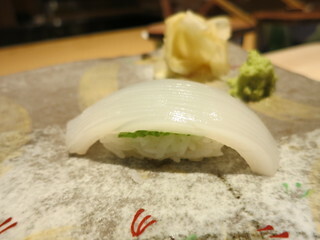 Just like Nozawa's style, the rice is served slightly warm so that the sushi feels like it's melting in your mouth. 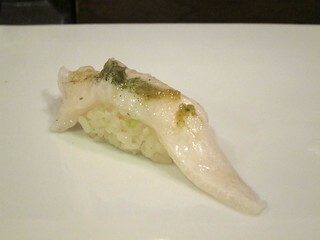 Fresh and firm squid on top of a shiso leaf. A generous serving of it, too! I used to complain that there was no stellar sushi in Pasadena, but that was before Sushi Kimagure moved in. The man behind Kimagure is Ike-san from the beloved Sushi Ike that was in Hollywood. The day he decided to shutter his Hollywood spot and open up in Pasadena was a good day for us. Dining at the sushi bar at Kimagure is by reservation only, and considering our 7pm party did not leave until near closing time, there's probably only one seating per night. It was my long awaited first visit so of course we had omakase. We didn't get Ike-san as our itamae that night but our meal was still excellent. 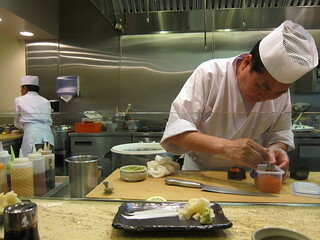 It was impressive to watch how fast these sushi chefs were working, especially considering their age! Most places may save toro towards the end of a meal, but here they dive directly into bluefin tuna (maguro) and toro as your first pieces. 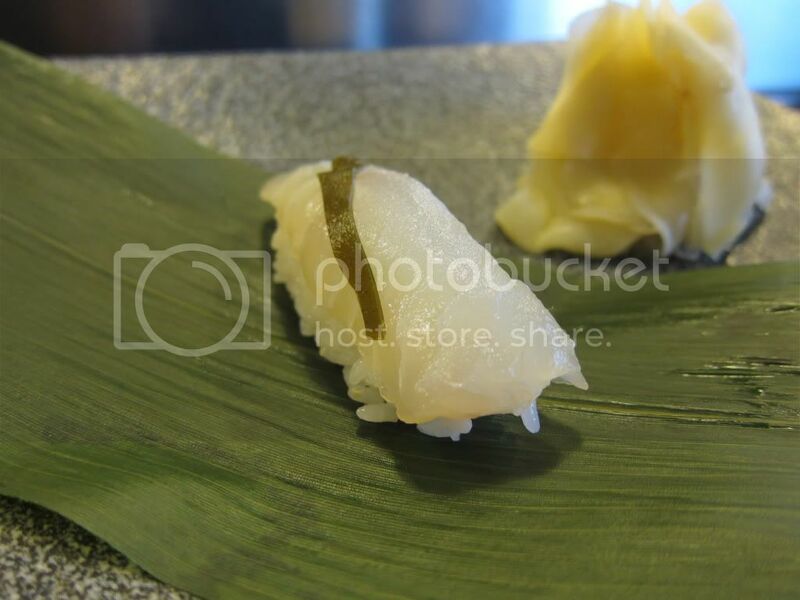 Sushi is not just about the fresh fish, but the rice as well, and here at Kimagure they are both excellent. It's not the warm rice of Nozawa (which I sometimes think is too warm and detracts from the fish) but it still melts in your mouth. Shunji is one of the hot recent restaurant openings, with Chef Shunji Nakao's serving his "contemporary" omakase in an inconspicuous stand-alone building on Pico Blvd. 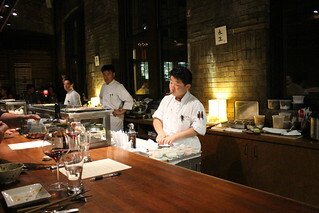 There are only a handful of tables and a few seats at the sushi bar, and the chef prepared most of the dishes personally (some get fired in the kitchen). His printed menu looks like the standard Japanese restaurant, but we had read about his omakase (the omakase was not printed on the menu) and just asked for that. Kiyokawa had been on my to-try list for some time since Jonathan Gold loved it so much, but I had sort of forgotten about this little place in Beverly Hills and stored it in the back of my mind. I recently dug it out and made it a point to finally go. 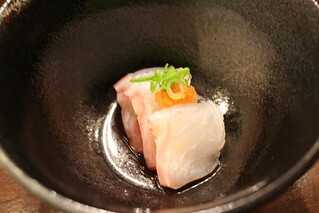 There are two omakase options at Kiyokawa, a full omakase (kaiseki) for $78 or a sushi-only omakase for $48. As I sat down and read the omakase menu there were things like miso black cod and other cooked items, but then they told me to ignore the menu. 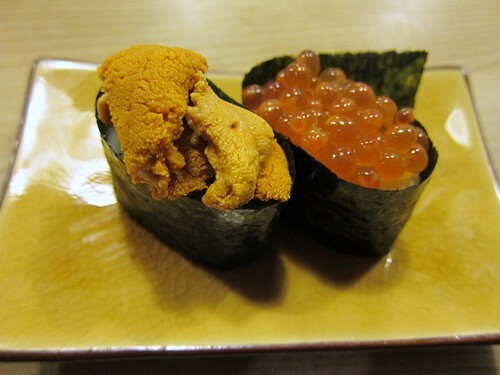 They had just started a new omakase menu and it was completely different than what was written. 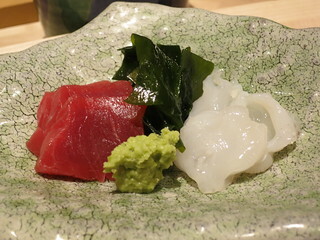 They recently changed the omakase menu to be more sashimi-focused rather than cooked dishes. Sounds even better to me. 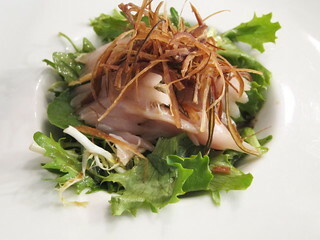 This was a rather big plate for a second course with plenty of albacore. 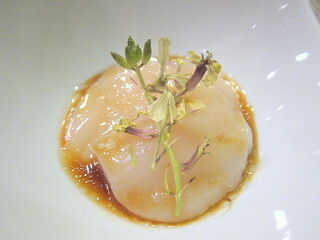 As the ponzu sauce that normally comes with albacore tends to be too astringent for me at times, I preferred this. 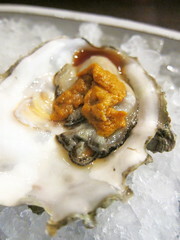 Still, the oyster with the creamy uni stole the show for me. 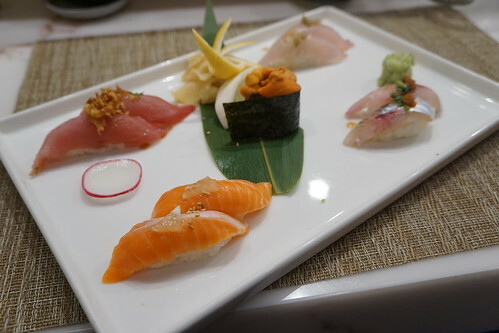 Toshi Sushi (Little Tokyo): Omakase vs "Omakase"
Craving sushi, I remembered that Toshi Sushi in downtown has received a lot of praise from fellow bloggers recently, including Sinosoul, djjewelz, and others. We came on Easter night and the restaurant was empty. I asked to sit at the sushi bar, and the waitress asked what I was going to order. Sushi? Probably Omakase? 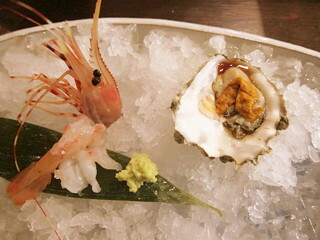 Then she asked what kind of omakase I'm ordering, the set or something-or-other. daily appetizers, asari (clam) miso soup, wagyu tataki, grilled black cod, and "most valuable 10 pieces of sushi assortment of the day", and ice cream. This is the meal that djjewelz reviewed. OK, understandable if the place was full, but why do they care if the restaurant is empty. Moving on, I said I'll order whatever is needed for me to sit at the sushi bar. We ended up getting a full-on omakase. Whatever Toshi-san wants. 1. 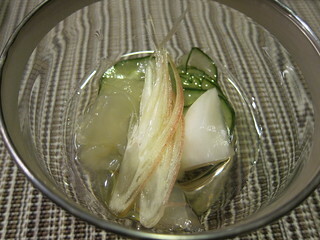 We started with some appetizers: seaweed from Japan, mountain yam, shark fin, and pear. Some of you may be furious about the sharks fin offered here, but I wasn't. 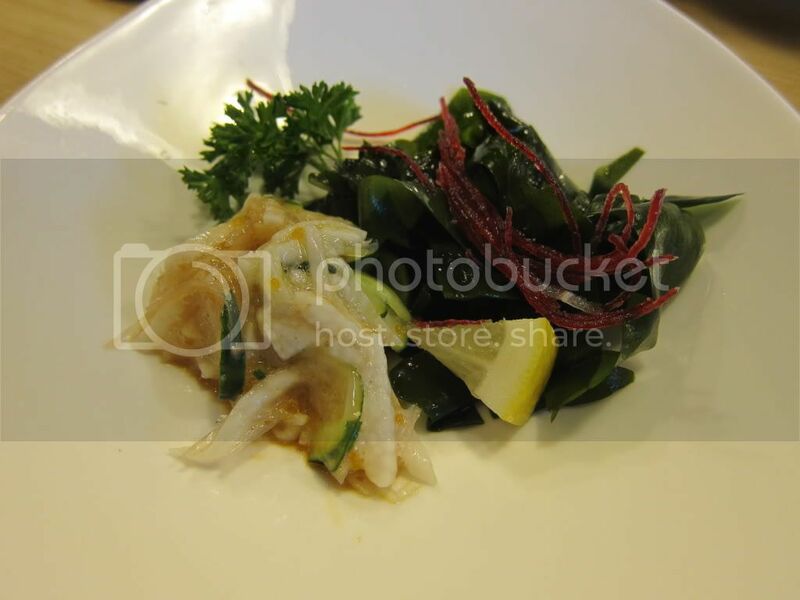 I grew up loving sharkin and stil do ... A nice combination of texture here between the sticky yam and seaweed and the crisper pear and sharkfin. 2. 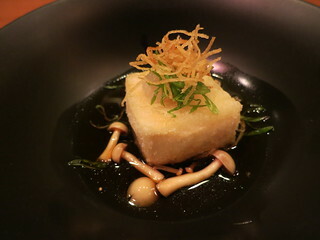 Halibut with marinated seaweed. This first sushi course is a wonderful introduction of the freshness of the sushi we were about to have and the subtlety of Toshi-san's touch. 3. 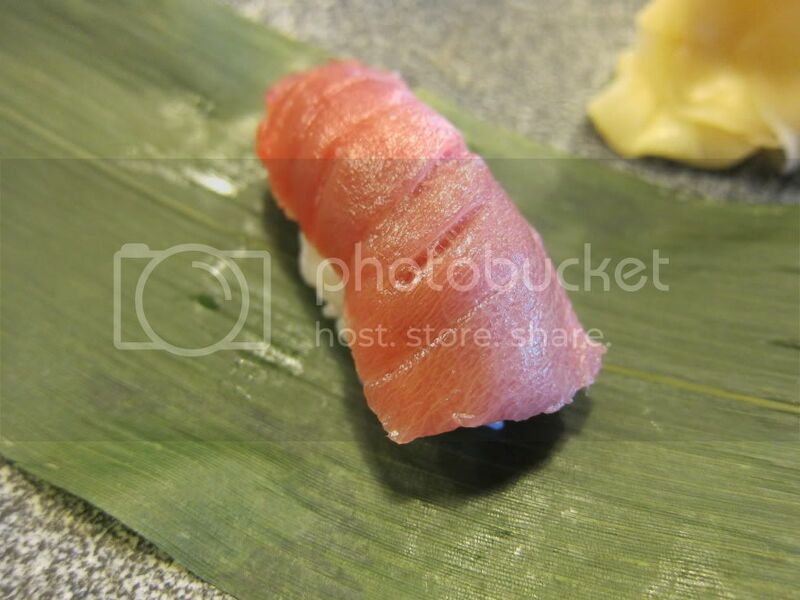 Bluefin tuna from Spain (that I forgot to take a photo of). 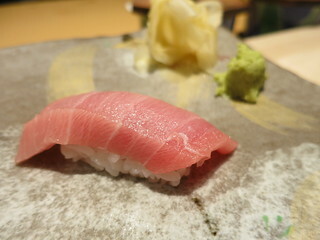 It's smooth and fatty, amazingly so for a non-toro tuna. Fresh and chewy. The marinade is light and not overwhelming. Chewy texture. The batter is a bit salty and greasy but the dish overall is good and flavorful. 6. 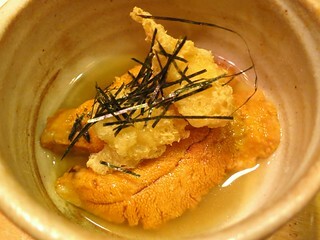 Mackerel with marinated seaweed. 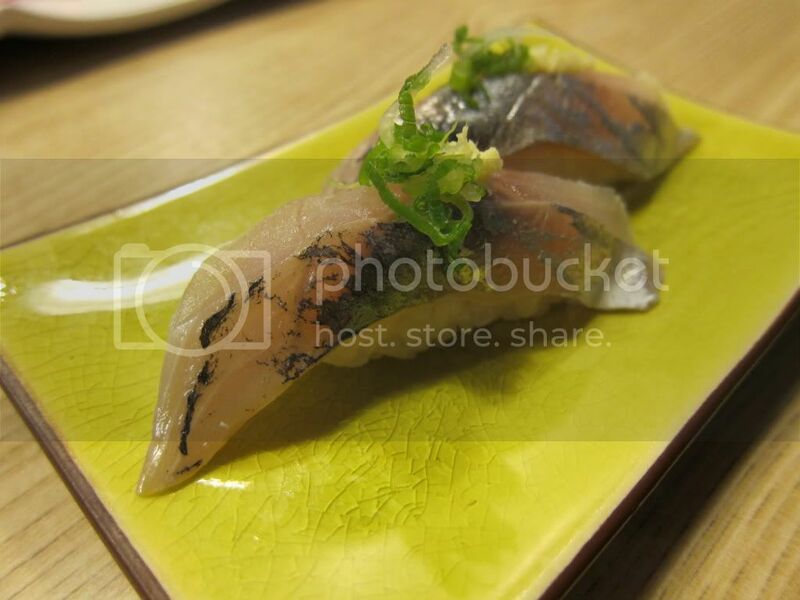 The mackerel has a natural saltiness. Both the flavor and texture are quite nice. 7. 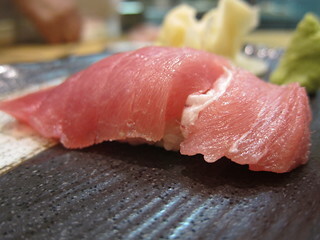 Chu-toro bluefin tuna from Spain. 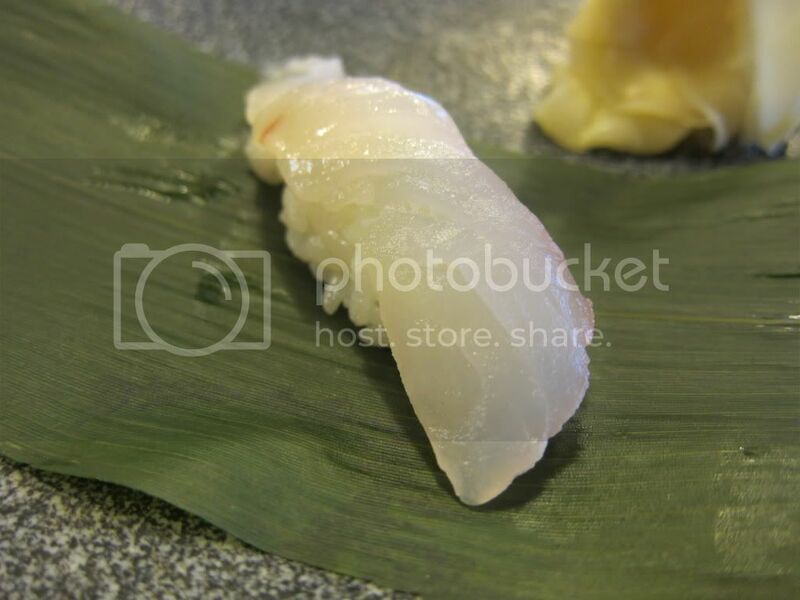 This piece was not too fatty but still melts in your mouth and has that nice oily flavor. 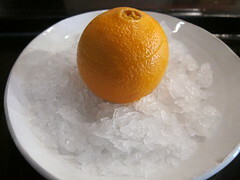 And of course, fresh. 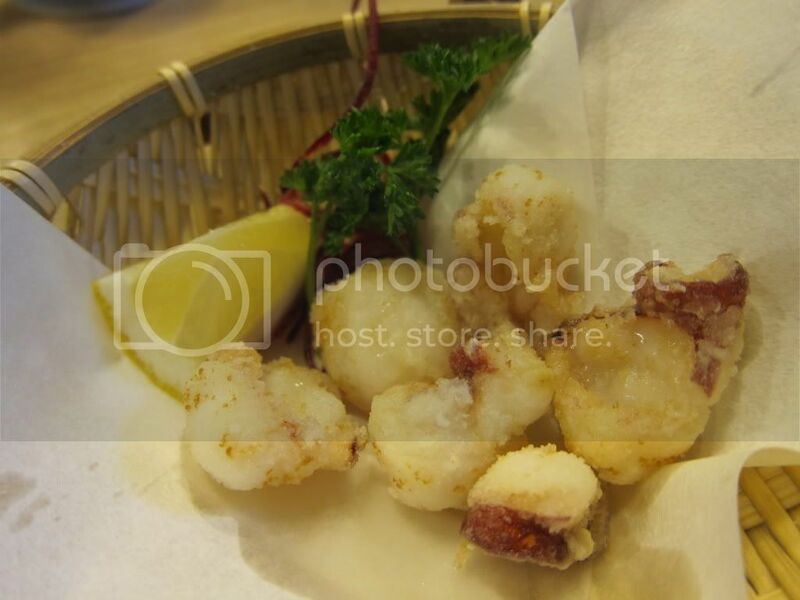 Nice and crunchy, surprisingly so as usually cooked sea cucumber is very fatty and tendon-like. Still, if you're used to sea cucumber you would enjoy this and otherwise it might be too weird. This has a bit too much sauce for my taste. Sweet and slimy. Loved it. 9. 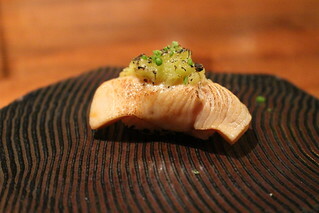 Now we're back to the fattier and heavier side of the meal, starting with Hamachi belly. 10. 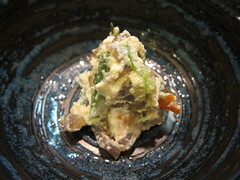 Slowly baked bluefin tuna cheek. 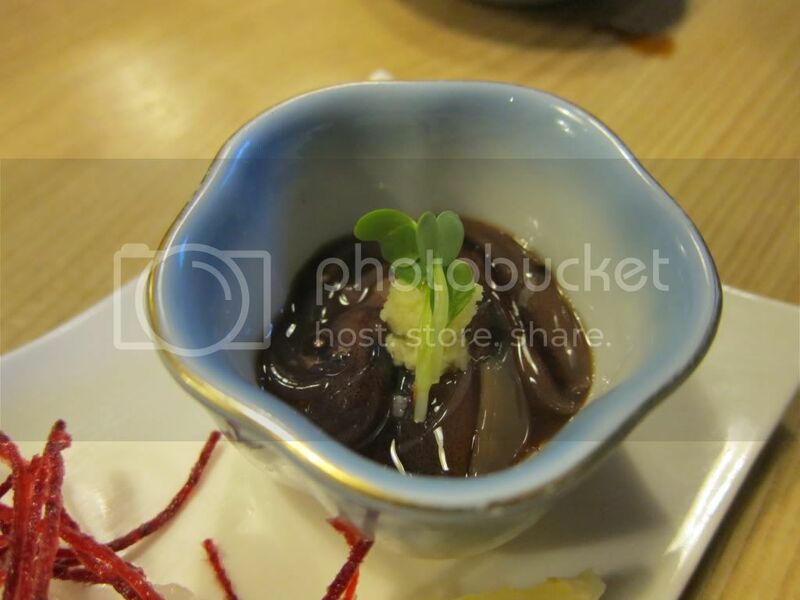 This was my first time having cooked bluefin tuna cheek and it was amazing. It was tender but a bit chewy and meaty, had lots of flavor, a lot of oil. Excellent. 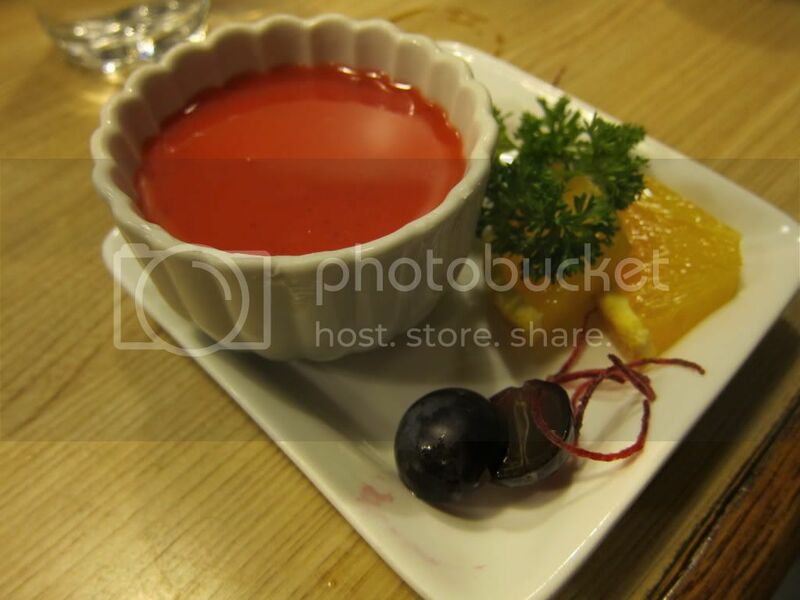 If Toshi has this when you go, do try it. 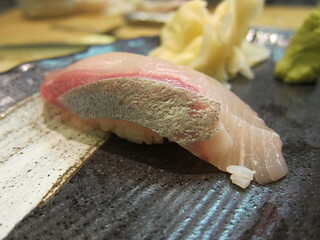 Melts in your mouth, definitely much fattier than the chu-toro. 12. 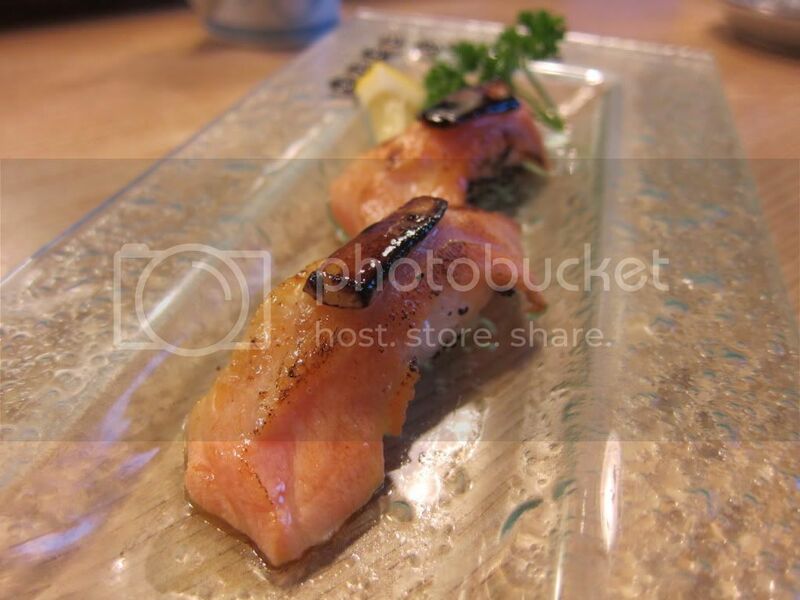 Seared salmon belly with foie gras. Fat on fat. Oh yes. The texture and flavor combinations are great, in that fatty melt-in-your-mouth-save-my-heart kind of way. 13. 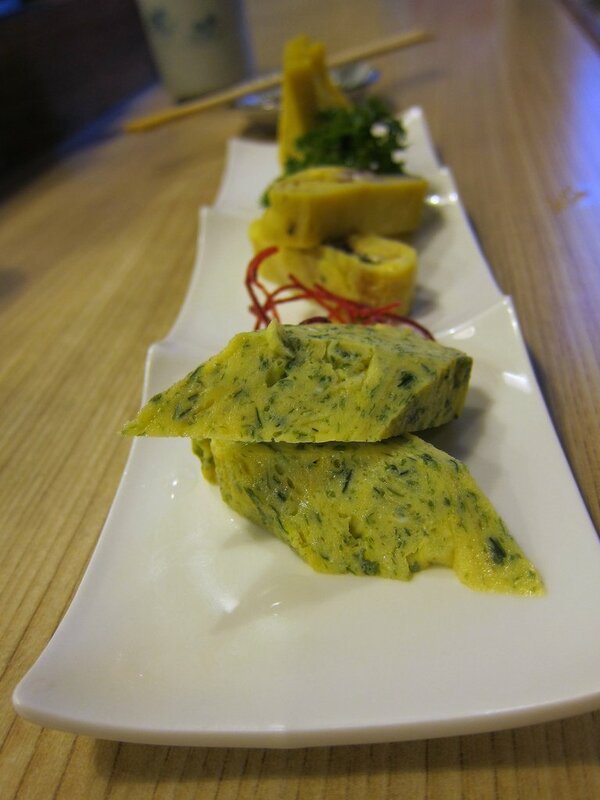 Tamagoyaki with seaweed powder, tamagoyaki with yam, shiso, and plum, and a regular tamagoyaki. In those Japanese comics or drama people always argue whether or not they like the salty or sweet tamagoyaki. Well, here we have both and more. The sushi here is never overwhelmed by sauces. 15. 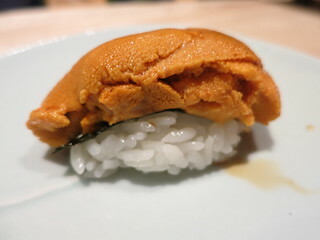 To finish up, I had an order of really sweet uni (Santa Barbara) while my not-an-uni-lover-companion had some ikura. 16. 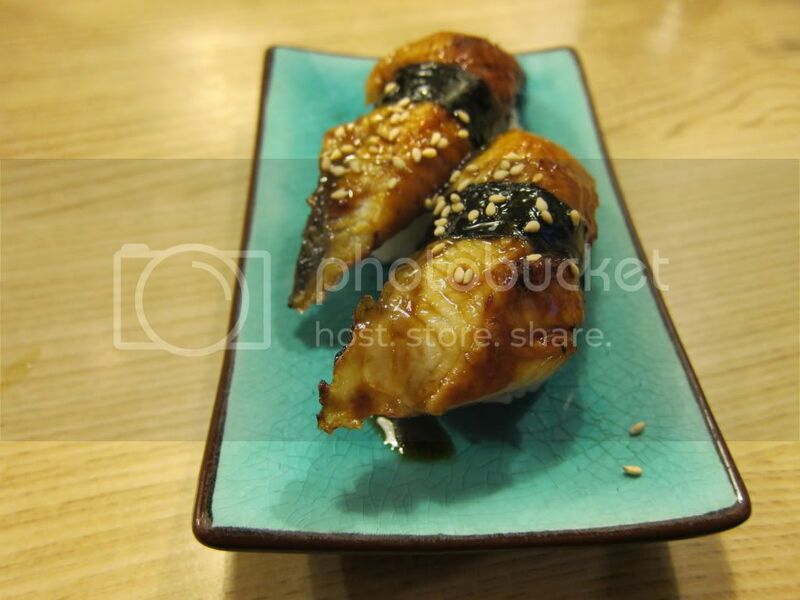 Followed by an order of unagi. Nicely seared meaty unagi and again, not doused in too much sauce. 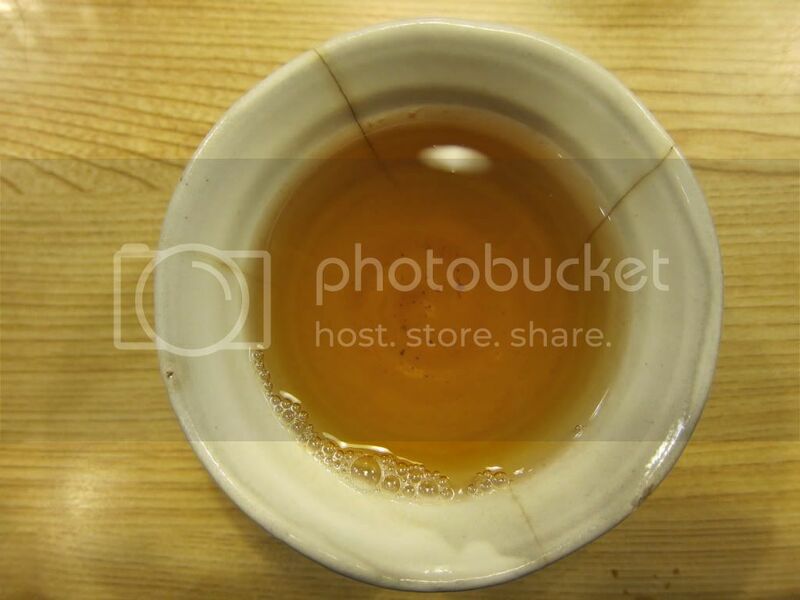 Brown rice tea to cleanse off. Panna Cotta This dessert worked better than the soufflé for us. This meal wasn't $44.50. Obviously, right? That would've been amazing. Still, we got away with ~$80 per person after tax and tips which I still think was a great deal considering what we ate. 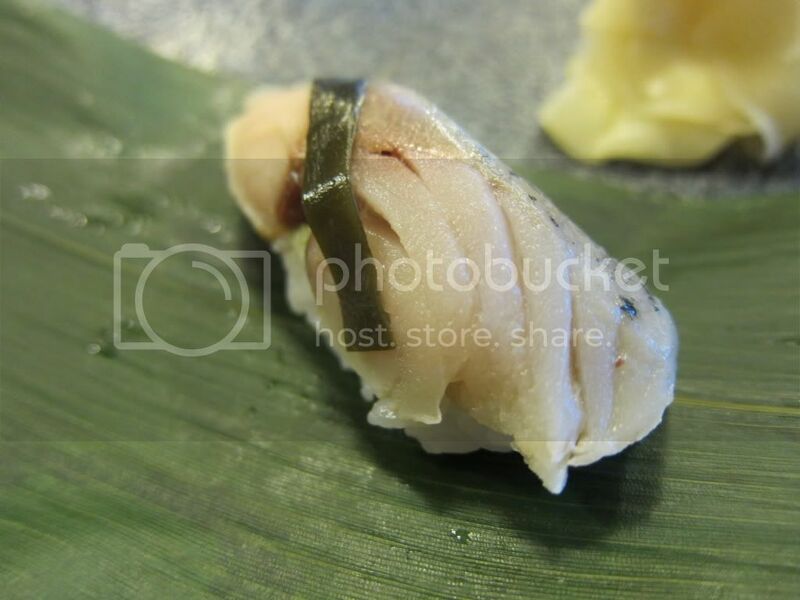 I was quite impressed with the quality of the sushi we had, and that baked bluefin tuna cheeks? Incredible.